HomeBusinessWho really influences the price of oil? December 7, 2018 Business Comments Off on Who really influences the price of oil? Opec, the Organization of the Petroleum Exporting Countries, has certainly had its share of criticism over many years. 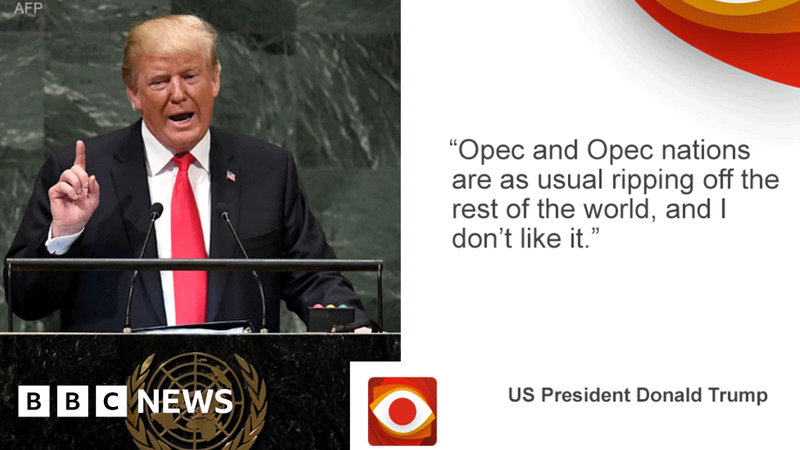 President Trump recently accused the group of “ripping off the rest of the world” and keeping oil prices “artificially high”. It has sometimes been charged with holding the world to ransom – notably in the mid-1970s when it cut supplies and the price tripled. But as Opec energy ministers meet in Vienna, does the group really wield that much influence any more? They are being joined by some non-member oil-producing countries, notably Russia. The group wants to stabilise or increase crude oil prices, which turned sharply downwards in early October. The main tool it has is to manage its own production levels – either by cutting if it wants prices to rise or increasing supplies if it wants them to fall, at least to a point that would not cause prices to collapse. Opec’s presence in the market is certainly big enough to make an impact. It accounts for more than 40% of global crude oil production. It was higher – more than half in the early 1970s – but the current figure is still a substantial share. But the other 60% of the industry also matters. Two non-Opec countries are especially important in different ways: Russia and the United States. Russia has contributed to Opec’s current effort to move prices higher. It began in 2016 with an Opec decision “to implement a production adjustment”, which means a cut of 1.2 million barrels a day. Crucially, Russia and a number of other non-Opec members joined in the effort with their own commitments to restrain production. Following that, prices did gain with the main international price, Brent Crude, reaching $86 (£67) a barrel in early October – it was below $50 a barrel in the period before that decision. That is not to say the decision by Opec and partners was the only factor. Political turmoil in Opec countries Venezuela, Libya and Nigeria has made it impossible for them to produce the amount of oil that in theory they could. Iran has been hit by the reimposition of US sanctions over its nuclear programme. The possibility that Iran’s oil might be unavailable to the global market – or that there would be less of it – has been an important factor pushing prices higher this year. But some of Iran’s biggest customers – China, India and Japan – have been given temporary exemptions and can continue to buy Iranian oil for now without being hit by US action. As a result, prices actually turned down as there was less demand for oil from other producers than had been expected. That said, the rise in prices since late 2016 did owe something to the agreement between Opec, Russia and others. Within Opec, Saudi Arabia has been key. According to estimates from the International Energy Agency, Saudi Arabia accounts for more than a third of Opec’s total production capacity and more than half of the group’s spare capacity. That is an indicator of the extent to which production is being restrained. Important though Saudi Arabia is, it was reluctant to act alone over prices. So it expected, as it generally does, other Opec members to make some sacrifice, but it also wanted Russia involved. There is a third very large player in the global business; the United States, currently the biggest producer of all. The US is a very different beast from the others. Oil is produced by private industry making decisions on the basis of what is profitable. Russia’s big oil companies are close to the government and the dominant firm in Saudi Arabia – Saudi Aramco – is state-owned. American oil producers do not co-operate with Opec to manage prices, because that would be illegal under US anti-trust or competition law. But something has happened in the US in the last decade or so that has transformed the global industry – the rise of shale oil. The exploitation of a relatively new type of resource has reversed a long-term decline in US oil output. The country still has to import oil. But now it can meet two-thirds of its own needs whereas just over a decade ago, it was one-third. Also shale can respond more quickly to a changing market. It does not need such large-scale investment as conventional oil. The investor can get their money back much more quickly, so shale output can be boosted more rapidly when prices start to rise. Shale was one of the reasons that oil prices fell sharply after mid-2014. One possible reason Opec did not respond sooner than it did was a desire on the part of some members, notably Saudi Arabia, to see US shale producers squeezed by lower prices. Opec does still matter, but it is far from being fully in charge of the global oil market. And in the longer term, if global efforts to address climate change mean we become less reliant on oil – a big if perhaps – then Opec will matter a great deal less.